The Lenny family enjoys a close connection to the ocean – and to each other. Aloha, dreams, hard work and smiles. Martin Lenny told me a story once, it was a story that started with family – a family connected to the ocean. In the early days as Martin and Paula were working double jobs while raising their family, they recognized that their son Kai was active – super active. Kai, whose name means, “ocean” in Hawaiian was happiest in the ocean.The best way to feed his need for action was to top off each day with time at the beach – doing whatever ocean sport was suitable for Kai’s age. Fortunately, his family recognized that Kai had more than just a love of the ocean, he also had a passionate dream. 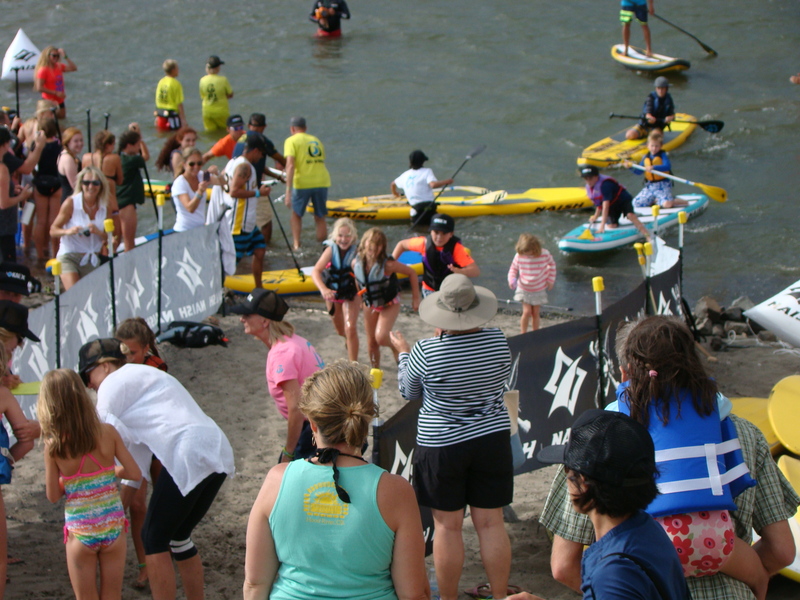 Kai learned how to surf at the age of 4, windsurf at 6, stand up surf at 7 and kite surf at 9. Learning how to do these sports all happened naturally, and from it grew his love affair with the ocean and the waves. Mentors have been integral to Kai’s ability to soar toward his dream. 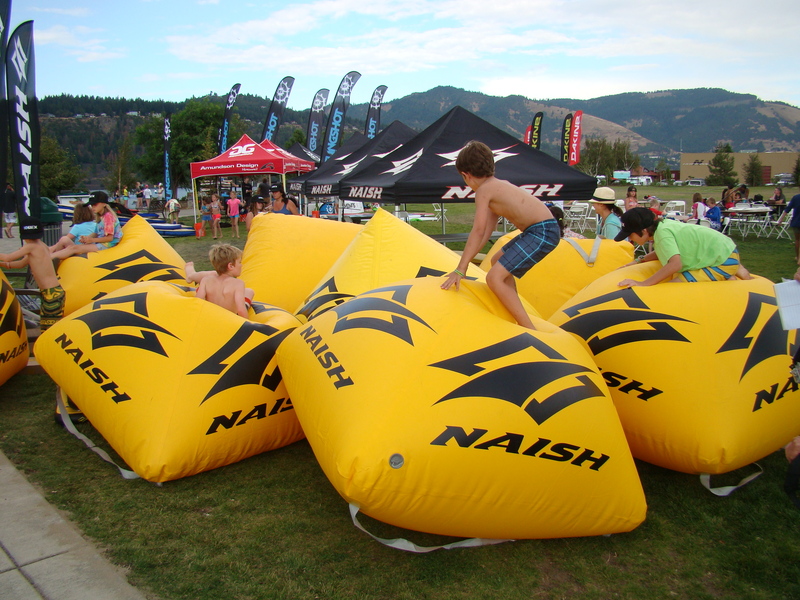 The early days’ mentoring from Robby Naish has evolved into a lifelong friendship. 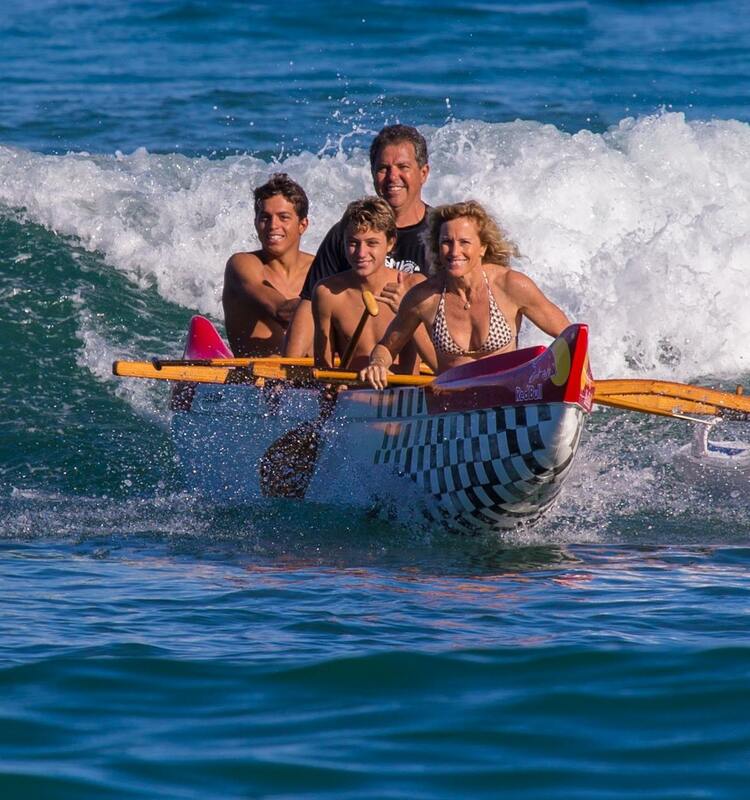 Few his age have enjoyed training with not only Robby, but also legendary watermen like Laird Hamilton, Dave Kalama, Buzzy Kerbox and Chuck Patterson. Kai eagerly adopted just about every sport that involved water, wind and waves. A common thread among his mentors and his family has inspired Kai as he has become a champion, a leader himself: Give back to the next generation by mentoring and consistently sharing aloha. It was exactly this sort of mentoring and inspiration that helped Kai continue his life journey toward his own dream. It is very obvious that the entire Lenny family lives this commitment to sharing with the next generation of standup paddlers. 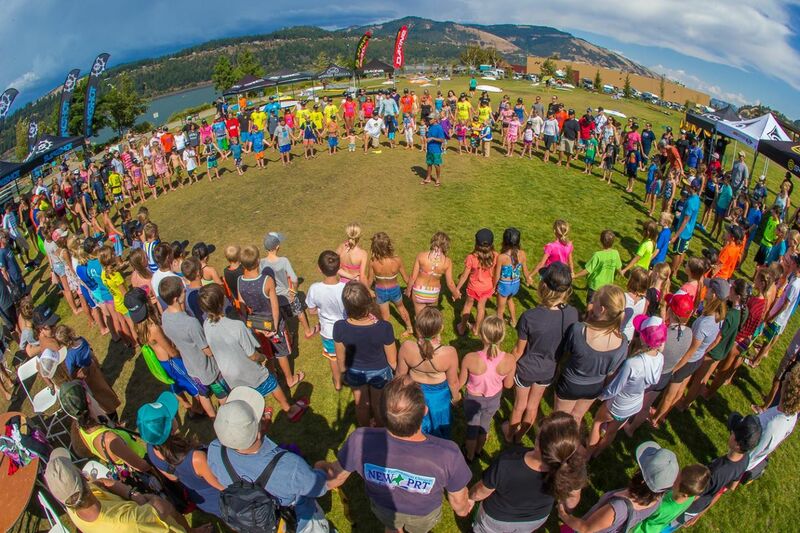 In the spirit of mentoring and giving back, Kai has created a series of clinics for groms (young surfers) called, “Positively Kai.” Yesterday in Hood River we enjoyed watching the free clinic supported by sponsors (Naish, Hurley, Red Bull, Nike, GoPro , Turtle Bay Resort, Vertra, MFC and others). 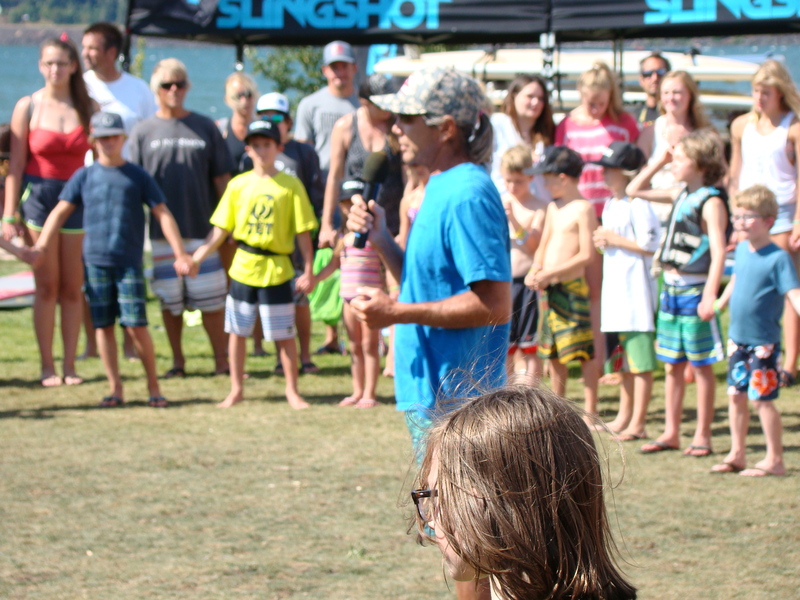 The clinic began with a prayer circle created by three concentric circles of hundreds of groms, family and friends holding hands and following the words of Gerry Lopez. 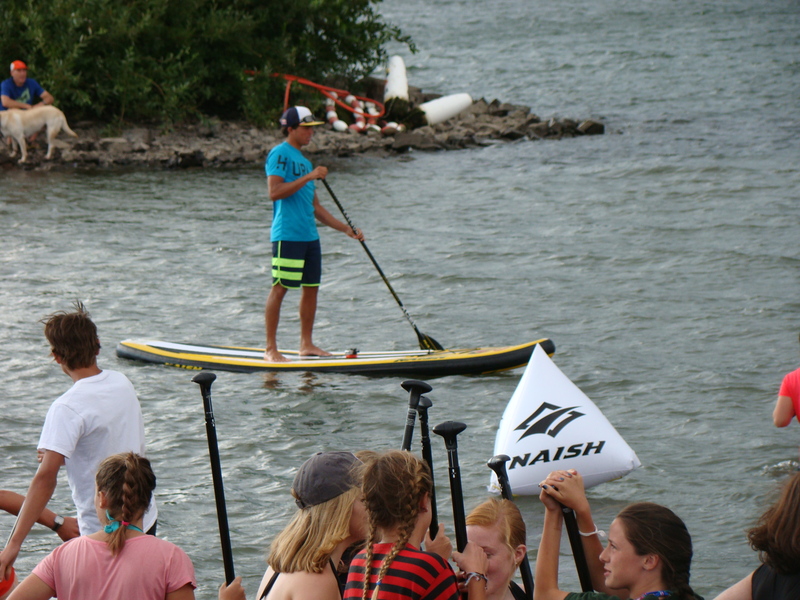 Soon afterward, the groms were organized by age group and taken for more land instruction by the Big Winds JET team riders and many elite standup paddlers like Connor Baxter, Kody Kerbox, Chuck Patterson, Noa Ginella, Riggs Napoleon and more. 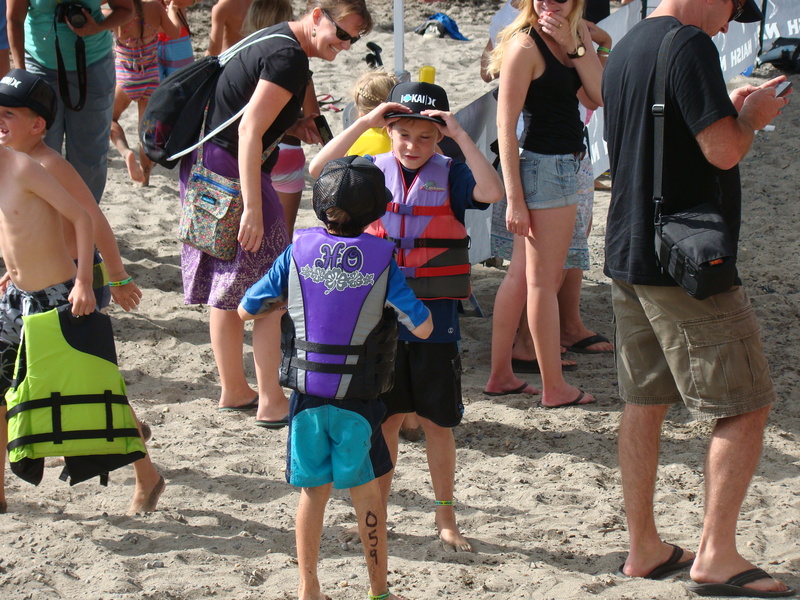 Age group races were an exciting part of the clinic but the real stories happened on the beach! One group of 8 year olds pow-wowed on the sand as the one more experienced paddler shared confidence and some words of wisdom to his peer. One exceptional paddler, Estani Bori age 10, had some obvious experience, skills and maybe that same passion that once fueled Kai when he was 10. He flew around the race course, then ran down to the beach to help collect the boards from the other racers as they finished. He was on the water doing tail turns and sprints all afternoon. I caught up with his father, Pablo. Again and again all day long that is what stuck – the number of kids and parents, entire families smiling and sharing the stoke that is SUP. The energy of more than 400 people through the dance-off, the dinner of yummy burritos (Kai’s favorite) and the awards was stellar.